The Gas Candy Stove is designed for cooking of fudge, caramel, toffee, brittle and more. Two stove sizes are available to seamlessly integrate with a range of kettle sizes, portable electric agitators and electronic thermometers. The #20 stove, the choice of most candymakers, is CSA certified to gas and sanitation standards for USA and Canada and will cook batch sizes up to 45 lb/20 kg, depending on recipe and kettle size. The #20 is for kettles 14"/355mm to 20"/510mm in diameter. A Portable Agitator is available for the 20" kettles. 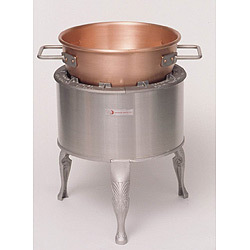 For larger 24"/610mm diameter kettles, the #33 stove is the choice. Add a digital temperature controller and turn the stove into a COOKER. SHIPPING WEIGHT 68 lbs. / 30 kg. 132 lbs. / 60 kg.